Shoppers grab formula before it can get on shelves. 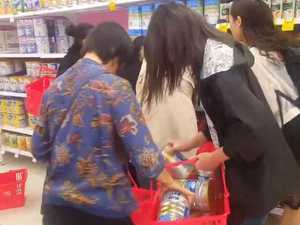 News A FURIOUS mum has photographed Woolworths customers loading up an entire trolley full of baby formula, despite a new two-can limit. Parenting AUSTRALIA is home to 80,000 daigou — Chinese shoppers who buy out products in bulk. The problems they cause could soon be over. News A MAN has been charged after allegedly leading police on a pursuit in a stolen truck filled with stolen tins of baby formula.